(Please note that many games, particularly newer ones, will have some of these tips integrated as part of the method. Have some good tips of your own? Please let us know in comments). Create the characters together in the group, or at least spend some time in a physical meeting or via e-mail/Facebook group talking a bit about the campaign you want to run. Make sure the characters have some points of contact to each other. Figure out why they will experience things together as a group (most roleplaying games still presuppose this as a default, though there are exceptions). Do they already know each other? Are they stuck in the same situation? What ties them together? Make sure the characters have some interesting weaknesses/challenges to overcome. Preferably also some clear goals (that do not conflict with each other to the extent that they can’t cooperate). Drama = conflict, but if the conflicts between characters are too big, the campaign might be short-lived. Plan adventures and campaigns based on the character’s background, interests, skills, goals and motivations. Let them be the main characters. Tie important elements of the plot directly to the characters. Plan starting points and “hooks”, not solutions. Preserve the player’s freedom. When preparing an adventure: give yourself a framework for improvisation, not a finished map over how events will play out (players generally dislike being “railroaded”.) This will ensure both your and the player’s freedom during play. The game is created at the table, not in your study in advance of play. Don’t cling too tightly to your secrets, bring them into the game. The true excitement is in seeing what happens when the secrets are revealed. Non-player characters (NPCs) are one of your most important tools. Plan a handful of these in advance of the game. Write briefly, just a few keywords about who they are. Sketch them out in a simple “relationship map.” How do they relate to the characters? To each other? How do they relate to the plot? What’s their agenda? Write them down between each session of play. Having prepared a simple list of a dozen typical men’s and women’s names from the setting can come in handy when you have to name NPCs on the fly, during the session. – Don’t spend lots of time preparing things you feel reasonably certain will never see play. Make sure all characters get some spotlight, and all players get a chance to speak. Follow up on player’s initiatives and ideas. Reward them, add to them. Maybe their ideas are just as good as what you’ve planned. Players will rarely do exactly what you expected. This is a strength, not a weakness, of roleplaying. Relish the opportunity to improvise and think at the drop of a hat. Take a short break if you need to gather your thoughts. Breaks are good. A bit of food before or after the game is good. Some snacks is good. Many groups like playing with a bit of atmospheric music. Some GMs use prepared handouts. Most groups will need dice, books and some pencils and paper to make notes with. Cell phones are a distraction. Ask players to turn off the sound and put them away. They can check them during breaks. It’s better to allow frequent, short breaks than a lot of off-topic conversation during the game. Use the player’s imagination. Ask them what the setting looks like, what the character is wearing, how she’s feeling, if the character knows anyone in the area, etc. Never reduce them to a passive audience, they should be active participants and co-creators (otherwise, they might as well be watching a movie). Build on and add to their input. 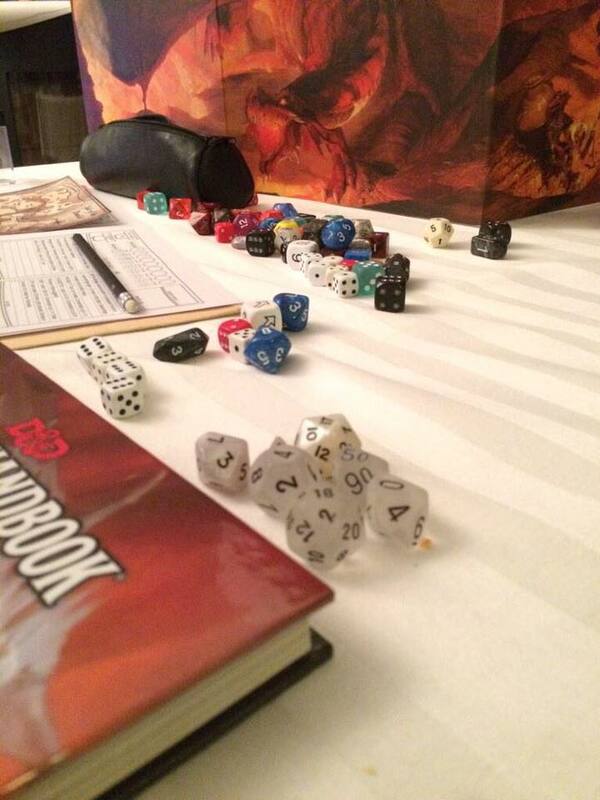 If you are not ready to have the character fail at a given task, don’t ask the player to roll. “Say yes, or roll the dice”. Be careful giving the players challenges where there is only one possible solution. Try to leave challenges open, possible to solve in various ways. You don’t always have to picture a solution in advance, leave it to the players. Make some notes as you go. Write a brief synopsis (half a page should suffice) after the game. This documentation will prove a goldmine when planning future sessions. As game master in traditional games, you have a lot of freedom to establish scenes where you want, decide which characters and NPCs are present, and what is going on when the scene starts. You can start in the middle of the action, spend time on exposition, cut a scene when it feels *dramatically right* rather than when the players are starting to get bored. Keep the action moving, at the same time as you’re preserving player freedom (you’ll get better at this balancing act given experience). Timing. You’ll train your sense of dramaturgy by experience, and start with what you got. You’ve seen movies, played games, read books. A lot of this is already in your blood, and you’ll learn as you go. We are never fully taught as game masters. Timing has to do with when you reveal secrets, introduce new threats, cut scenes, raise your voice, whisper, sit quietly and just stare at the players for a quarter of a minute, or put on *that particular* song.